Just going to throw this out there as we have expierenced this more and more. Once the dog days of summer come around and the water temp rises in the bay, there is no better place to fish than MTK. We would head east early in the AM, fish the mutliple spots for fluke and than wait for a favorable tide to fish for stripers around the point. If you are lucky and limit or just get tired and want to head in, hit westlake on the way back in Mtk for a beverage and a snack. Side Note: Anybody fish offshore? Canyons? Sharking? Schoolie bluefin off block? Will be making a few trips this year south and looking for buddy boats/crew. Always looking for more friends. In for this group. I am out of Southold in the summer. I’m out of Albertsons Marina in Southold next to Port of Egypt. Great service and much more affordable . Plenty of awesome fishing in the area for sure but likely most don’t share well. I will try to chime in along the way. There is a reason Skinner bought a house in Greenport. Honestly, we really want guys who enthusiastically share their info with each other. If too many people want to get and not give we can always start a closed Facebook group. Look forward to seeing you out there reeling them up. There was some initial interest in last years central/eastern sound thread. But no one ended up posting reports. Hi, I was the guy who tried to get that thread off the ground last year. There was not enough interest ( 2 or 3 guys) for sound side . I'm hoping that this thread on East End Peconic attracts enough guys. About 6 so far expressing interest. That's not entirely true - I know I posted a few myself, and there were others, but there wasn't a ton of traffic. I'm heading out next weekend, although I'm not expecting much - early reports of bait in waters out west and on the south shore, but anything I've heard from NoFo indicates the waters are still barren. I was hoping to do some work on the boat to get it ready for the season and take the kayak out for a spin, but it seems like a possible noreaster might put those plans on hold. Not sure I want to test out how reliable my drysuit is in early April. I've shopped at Albertsons a ton of times but never thought of docking there. Are they on the bay side? The store isn't, never really paid attention to where the actual marina was. Great shop though, and extremely helpful staff. I do most of my shopping out at Lighthouse in Riverhead but it helps to have these guys a few miles from the house. I hope to be in and running by May 1st, the latest. Here's a photo of how I added Garmin Grid to my 1242 Touch units. I think it's a must to work the screens in the GUT. Cool, I didn't know that existed. Sending you a PM to sync up this summer/fall. Bait is in!!! Large bunker schools around. So this past weekend's fog made the boat a no-go, but I decided to work the back a bit to see if I could scare up some stripers (C&R only, NY didn't open until Monday). The good news - plenty of bunker and spearing in the water. The bad news - got skunked, with the exception of the biggest, meanest looking sea robin I've ever pulled out of the water (which is sort of like finding the tallest pygmy). The clamming was good, so all in all it was encouraging. Count me in too fellas. After a few decades of surf fishing all around the Island, I recently purchased my first boat. A Grady 22 walk around. Have a slip for it at Brick Cove in Greenport. As mentioned above, Brick Cove has a good reputation but it did recently go up for sale so I don't know what that will mean for its future. I expect to be out fishing at least once a week and will post results. Of course boat fishing is different than surf casting so I have a lot to learn. But a bad day fishin is better than a good day at work. I spend all my time in Cape Cod Bay these days but good memories in and around Peconic Bay. Welcome aboard Paul. I too am new to the East End Boat Fishing. 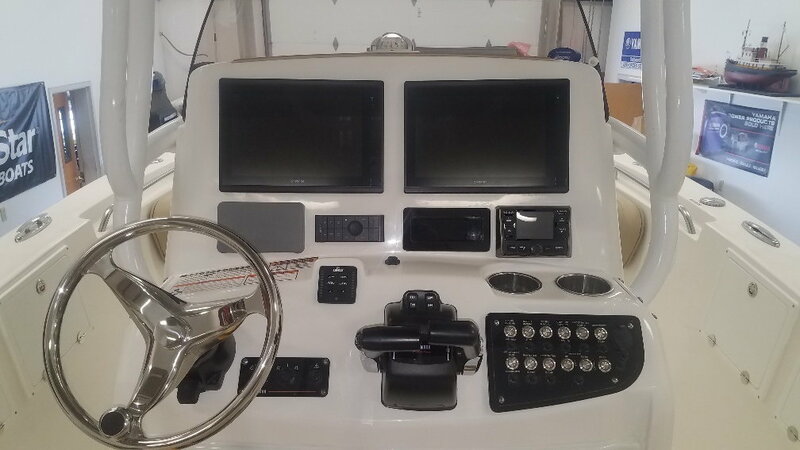 I'm anxiously awaiting delivery of my new NauticStar 2602 Legacy, moving it to Port of Egypt Marina and getting out on the water. Thus far, nine of us have signed on to the thread and I'm looking forward to a good season. Enjoy your new boat. L.I. Fisherman 4/15. "Look for flounder to improve a bit as bay waters slowly warm, and keep an eye on the Shinnecock Canal for the first signs of fluke, sea robins, porgies and maybe a weakfish or two over the next week or so. Blues and bass should also be making through the narrow waterway." I also saw a report of blues starting to show up around Gardiners Bay. If that is the case, the stripers are around. Up in the coves/rivers under bunker schools. Whitewater reported some striper action on the south shore as well. Black Sea Bass: 15" minimum size; 3/angler, June 23 - Aug 31; 7/angler, Sept 1 - Dec 31. NOTE: Anglers aboard federally permitted party or charter vessels may possess any number of Atlantic cod, consistent with federal rules. Porgy (Scup): 9" minimum size, 30/angler, May 1 - December 31; charter and open boat creel limit expands to 45/angler from September 1 - October 31.